Beginning March 27, 2019, Honeyfund is giving away a $1,000 Honefyund Gift Card to one lucky winner. 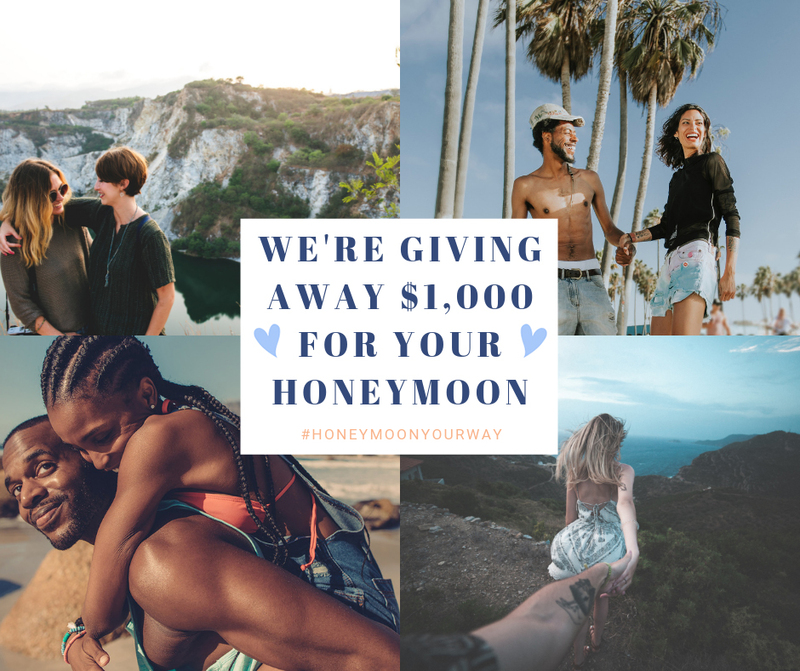 Honeyfund’s “Honeymoon Your Way” $1,000 Giveaway (the Sweepstakes) is open to legal residents of the US or Canada to win, and at least eighteen (18) years old at the time of entry. Employees of Honeyfund and other companies associated with the promotion of the Sweepstakes, and their respective parents, subsidiaries, affiliates and advertising and promotion agencies as well as the immediate family (spouse, parents, siblings, and children) and household members of each such employee are not eligible. The Sweepstakes is administered and sponsored by Honeyfund.com, Inc. (˜Administrator’), located at 2605 Enterprise Rd E, Ste 320, Clearwater, FL 33759. One $1,000 credit to honeyfund users’s honeyfund gift card balance. Comment on this Facebook post with the URL of your wedding website that includes a link to your honeyfund. An administrator of the giveaway will confirm your wedding website links back to your honeyfund and confirm you’re entered to win by replying to the comment on the post. Users without a wedding website can comment with a link to their honeyfund page and a written description of how they shared their honeyfund page with guests. Users without a Facebook account can enter by e-mailing support@honeyfund.com and including the URL of their wedding website that includes a link to their honeyfund. An administrator of the giveaway will confirm your wedding website links back to your honeyfund and confirm you’re entered to win by replying to the e-mail. All entrants receive one (1) entry for doing one of the above. All entries become the property of Administrator and Sponsor and will not be acknowledged or returned. On or about July 10, 2019, the Administrator will select one winner at random from among all eligible entries received throughout the entry period. The odds of being selected depend on the number of entries received. The Administrator will attempt to notify the potential giveaway winner via telephone on or about July 11, 2019. If the potential winner cannot be contacted within five (5) days after the date of the first attempt to contact him/her, the Administrator may select an alternate potential winner in his/her place at random from the remaining non-winning, eligible entries. The potential winner will be notified by e-mail. Each potential Prize winner (parent/legal guardian if a minor in his/her state of residence) will be required to complete, electronically sign and submit a Declaration of Compliance within five (5) days of the date notice or attempted notice is sent, in order to claim his/her prize. If a potential winner cannot be contacted, or fails to submit the Declaration of Compliance within the required time period (if applicable), or prize is returned as undeliverable, potential winner forfeits prize. If the potential winner is at least 18 but still considered a minor in his/her jurisdiction of residence, Sponsor reserves the right to award the prize in the name of his/her parent or legal guardian, who will be required to sign the Declaration of Compliance on the potential winners behalf and fulfill any other requirements imposed on winner set forth herein. Potential winners must continue to comply with all terms and conditions of these Official Rules, and winning is contingent upon fulfilling all requirements. In the event that a potential winner is disqualified for any reason, Sponsor will award the applicable prize to an alternate winner by random drawing from among all remaining eligible entries. Only three (3) alternate drawings will be held, after which the prize will remain un-awarded. All potential winners from Canada will be required to answer a time-limited skill-testing question correctly without any assistance to be eligible to receive a prize, or such prize will be forfeited. By participating in the Sweepstakes, entrants agree to release and hold harmless the Administrator and Sponsors, and each of their respective parents, subsidiaries, affiliates, advertising and promotion agencies, other companies associated with the Sweepstakes, and each of their respective officers, directors, employees, shareholders, representatives, and agents (the Released Parties) from and against any claim or cause of action arising out of participation in the Sweepstakes or receipt or use of the prize (including any travel or activity related thereto), including, but not limited to: (a) any technical errors associated with the Sweepstakes, including lost, interrupted or unavailable Internet Service Provider (ISP), network, server, wireless service provider, or other connections, availability or accessibility or miscommunications or failed computer, satellite, telephone, cellular tower or cable transmissions, lines, or technical failure or jumbled, scrambled, delayed, or misdirected transmissions or computer hardware or software malfunctions, failures or difficulties; (b) unauthorized human intervention in the Sweepstakes; (c) mechanical, network, electronic, computer, human, printing or typographical errors; (d)application downloads, (e) any other errors or problems in connection with the Sweepstakes, including, without limitation, errors that may occur in the administration of the Sweepstakes, the announcement of the winner, the cancellation or postponement of the event and/or the flyover, if applicable, the incorrect downloading of the application, the processing of entries application downloads or in any Sweepstakes-related materials; or (f) injury, death, losses or damages of any kind, to persons or property which may be caused, directly or indirectly, in whole or in part, from entrants participation in the Sweepstakes or acceptance, receipt or misuse of the prize (including any travel or activity related thereto). Entrant further agrees that in any cause of action, the Released Parties liability will be limited to the cost of entering and participating in the Sweepstakes, and in no event shall the entrant be entitled to receive attorney’s fees. Released Parties are also not responsible for any incorrect or inaccurate information, whether caused by site users, tampering, hacking, or by any equipment or programming associated with or utilized in the Sweepstakes. Entrant waives the right to claim any damages whatsoever, including, but not limited to, punitive, consequential, direct, or indirect damages. For the Winner List, watch this blog or send an e-mail to support at honeyfund dot com. Taking my fiancé on a surprise honeymoon where she won’t know until we get on the plane. This would be an wonderful surprise to win and to show her the world since she has hasn’t been able experience much travel. My wedding is June 8th 2019, would love to win ! !